Building upon the extensive compilation of biochemical data featured in Volume I of the Handbook of Eicosanoids, the new Volume II describes the past, present, and potential future impact of eicosanoid research on new drug development. The reader is taken from a historical perspective through state-of-the-art basic concepts to extensive tabulation of molecular structures of compounds known to act via the eicosanoid system. Much emphasis is given to recent breakthroughs in the mechanism of action of anti-inflammatory corticosteroids and the development of receptor antagonists for prostaglandins and leukotrienes. There is also an introductory chapter that proposes areas that require further investigation and novel approaches using existing technology. 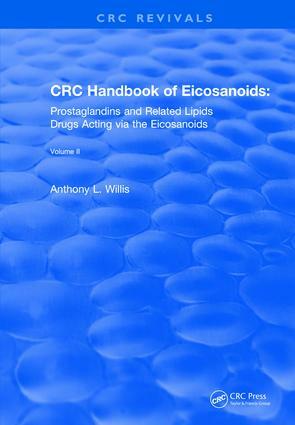 This handbook will thus be invaluable for medicinal chemists, pharmacologists, and all those involved in basic research in the eicosanoid area. In addition, many parts of this handbook are suitable for use by university lecturers and students. There are 20 figures and 44 extensive tables as well as a bibliography containing more than 2,000 references that complement the text.